Last year's intergenerational LGBTQ event was such a resounding success, we are having another (please help us spread the invitation)! 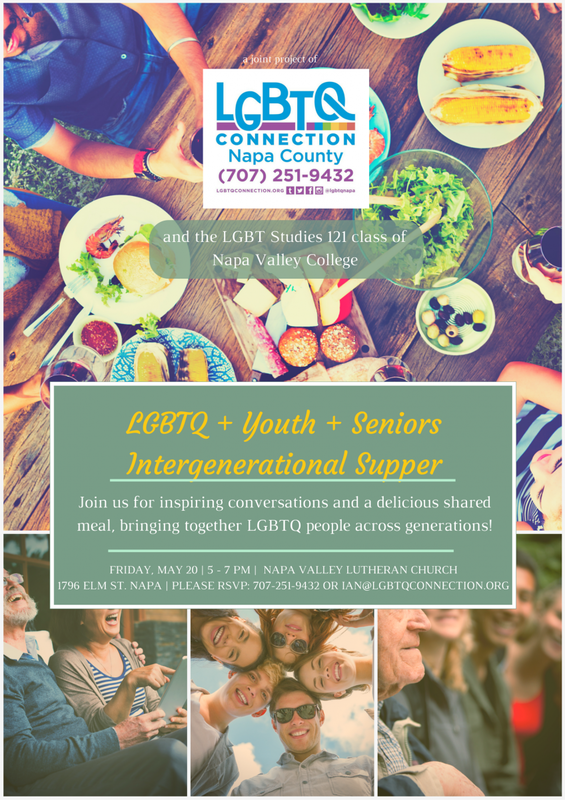 What: Youth & Seniors LGBTQ Intergenerational Supper--join us for inspiring conversations, fun activities and a delicious shared meal, bringing together LGBTQ people across generations! Seniors are encouraged to bring pictures of themselves as teens or youth. How: please RSVP by replying to ian@lgbtqconnection.org or calling 707-251-9432 (RSVPs are not required but very much appreciated). Thanks to our donors and sponsors, there is no cost for this event. Please help us spread the word so we can have another successful, heartwarming event! This event is co-sponsored by students from Napa Valley College's LGBT Studies 121 class. Also, special thanks to Napa County Health and Human Services for helping to sponsor this year's supper as part of May's Mental Health Month events!